I've told you that I serve as the assistant varsity coach in my community of Swartz Creek. It's a very busy time of year, which is why I have not posted an article lately. Today however I had to write about one of the most emotional and beautiful moments I've ever experienced in softball. The thing is that it really had very little to do with softball. Here's a little advice on how to handle these three possible outcomes. If you didn't care about it, it wouldn't hurt. Read more: Tryouts Are Over - Now What? It's that time of year again. Softball tryouts are taking place across the country and with them many aspiring players are experiencing serious anxieties. It’s perfectly normal, but can be debilitating and lead to markedly underperforming. Tryouts would not be a good time for this. 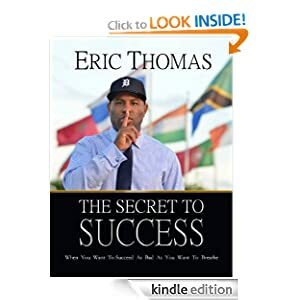 As parents you may not know who Eric Thomas is, but a couple years ago you likely heard his voice in a video that went viral. It was titled, How Bad Do You Want It? I recently read his book, The Secret To Success, at the request of my daughter who was reading it at college. She's a big fan and he is going to be on campus to give a speech to the all of the athletes shortly. The game between San Francisco & Seattle was a great game for football fans. Both teams battled leaving it all on the field. The winning play was made with San Francisco throwing the ball into the end zone on 4th down and virtually no time left. The pass was knocked down by Seattle's defensive back Richard Sherman on a truly spectacular play, which would ensure victory and a trip for the Seahawks to the Super Bowl. That clip probably made millions of instant Denver fans who will be rooting for Sherman and the Seahawks to lose. After time expired there were players and members of the media all over the field as the Seahawks & home team fans celebrated victory and a trip to the Super Bowl. Fox Sports sideline reporter Erin Andrews found the game's hero Sherman for a post game interview. If you haven't seen it, you should watch the brief clip below. Read more: Can You Control Your Emotions?